In 2013, the European Space Agency deployed the long-awaited Gaia space observatory. As one of a handful of next-generation space observatories that will be going up before the end of the decade, this mission has spent the past few years cataloging over a billion astronomical objects. Using this data, astronomers and astrophysicists hope to create the largest and most precise 3D map of the Milky Way to date. Though it is almost to the end of its mission, much of its earliest information is still bearing fruit. For example, using the mission’s initial data release, a team of astrophysicists from the University of Toronto managed to calculate the speed at which the Sun orbits the Milky Way. From this, they were able to obtain a precise distance estimate between our Sun and the center of the galaxy for the first time. For some time, astronomers have been unsure as to exactly how far our Solar System is from the center of our galaxy. Much of this has to do with the fact that it is impossible to view it directly, due to a combination of factors (i.e. perspective, the size of our galaxy, and visibility barriers). As a result, since the year 2000, official estimates have varied between 7.2 and 8.8 kiloparsecs (~23,483 to 28,700 light years). For the sake of their study, the team – which was led by Jason Hunt, a Dunlap Fellow at the Dunlap Institute for Astronomy & Astrophysics at the University of Toronto – combined Gaia’s initial release with data from the RAdial Velocity Experiment (RAVE). This survey, which was conducted between 2003 and 2013 by the Australian Astronomical Observatory (AAO), measured the positions, distances, radial velocities and spectra of 500,000 stars. Over 200,000 of these stars were also observed by Gaia and information on them was included in its initial data release. As they explain in their study, which was published in the Journal of Astrophysical Letters in November 2016, they used this to examined the speeds at which these stars orbit the center of the galaxy (relative to the Sun), and in the process discovered that there was an apparent distribution in their relative velocities. 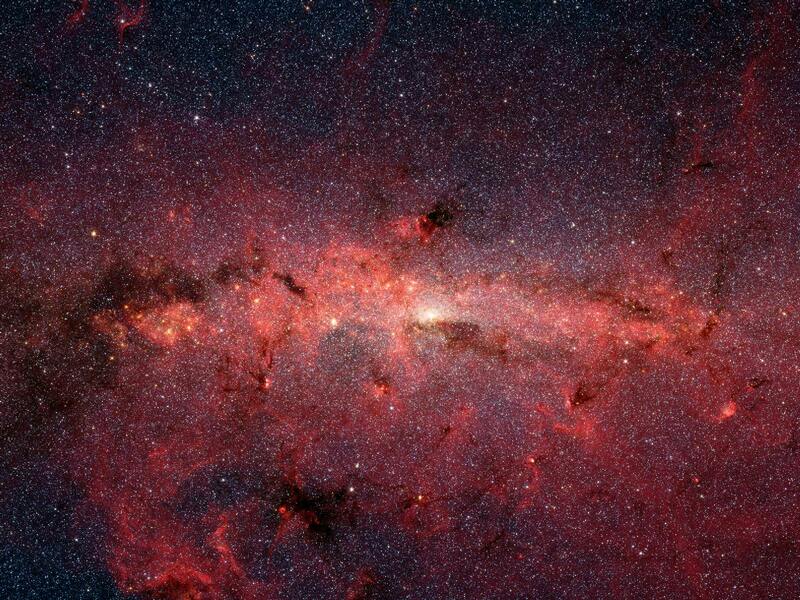 In short, our Sun moves around the center of the Milky Way at a speed of 240 km/s (149 mi/s), or 864,000 km/h (536,865 mph). Naturally, some of the more than 200,000 candidates were moving faster or slower. But for some, there was no apparent angular momentum, which they attributed to these stars being scattering onto “chaotic, halo-type orbits when they pass through the Galactic nucleus”. The next step was to combine this information with proper motion calculations of Sagittarius A* – the supermassive black hole believed to be at the center of our galaxy. After correcting for its motion relative to background objects, they were able to effectively triangulate the Earth’s distance from the center of the galaxy. From this, they derived a refined distance of estimate of 7.6 to 8.2 kpc – which works out to about 24,788 to 26,745 light years. This study builds upon previous work conducted by the study’s co-authors – Prof. Ray Calberg, the current chair of the Department of Astronomy & Astrophysics at the University of Toronto. Years ago, he and Prof. Kimmo Innanen of the Department of Physics and Astronomy at York University conducted a similar study using radial velocity measurement from 400 of the Milky Way’s stars. But by incorporating data from the Gaia observatory, the UofT team was able to obtain a much more comprehensive data set and narrow the distance to galactic center by a significant amount. And this was based on only the initial data released by the Gaia mission. Looking ahead, Hunt anticipates that further data releases will allow his team and other astronomers to refine their calculations even more. As more next-generation space telescopes and observatories are deployed, we can expect them to provide us with a wealth of new information about our Universe. And from this, we can expect that astronomers and astrophysicists will begin to shine the light on a number of unresolved cosmological questions. What’s At The Center Of Our Galaxy? Dr. Andrea Ghez has spent much of her career studying the region right around the center of the Milky Way, including its supermassive black hole. In fact, she helped discover it in the first place. Dr. Ghez speaks about this amazing and dynamic region. What are you looking for at the center of the galaxy? What’s it like around the supermassive black hole at the center of the galaxy? What are some of the discoveries? “The observations at the center of the Milky Way have taught us that one, it’s really normal to have a black hole at the center of the galaxy. I mean, our galaxy is completely ordinary, garden-variety, nothing-special-about-us, so if we have one, presumably every galaxy harbors a supermassive black hole at it’s center. We’ve also learned that the idea that a supermassive black hole should be surrounded by a very dense concentration of very old stars is not true. And that prediction is often used in other galaxies to find their black holes, because we can’t do the kinds of experiments we’ve done at the center of our own – that you look for this concentration of light, but in our galaxy we’re not seeing that, so you have a case where’s there’s absolutely clearly a supermassive black hole, yet you don’t see this collection of old stars. That’s a puzzle. How might those young stars get formed? Deep in the heart of the Milky Way resides a black hole. However, that is not the mysterious object which scientists Fabio Antonini, of the Canadian Institute for Theoretical Astrophysics, and David Merritt, of the Rochester Institute of Technology, have been endeavoring to explain. The objects of their attention are the orbits of massive young stars which attend it. They are called “S-stars”. No. That’s not a stutter. S-Stars are a legitimate phenomenon which enable researchers to even more closely examine black hole activity. Their very presence causes astronomers to question what they know. For example, how is it possible for these massive young stars to orbit so close to a region where it would be highly unlikely for them to form there? The sheer force of the strong gravity near a black hole means these stars had to have once been further away from their observed position. However, when theoreticians created models to depict how S-stars might have traveled to their current orbital positions, the numbers simply didn’t match up. How could their orbits be so radically removed from predictions? Today, Dr. Antonini offered his best explanation of this enigma at the annual meeting of the Canadian Astronomical Society (CASCA). In “The Origin of the S-star Cluster at the Galactic Center,” he gave a unified theory for the origin and dynamics of the S-stars. It hasn’t been an easy task, but Antonini has been able to produce a very viable theory of how these stars were able to get in close proximity to a supermassive black hole in only tens of millions of years since their formation. 3-dimensional visualization of the stellar orbits in the Galactic center based on data obtained by the W. M. Keck Telescopes between 1995 and 2012. Stars with the best determined orbits are shown with full ellipses and trails behind each star span ~15-20 years. These stars are color-coded to represent their spectral type: Early-type (young) stars are shown in teal green, late-type (old) stars are shown in orange, and those with unknown spectral type are shown in magenta. Stars without ellipses are from a statistical sample and follow the observed radial distributions for the early (white) or late (yellow/orange) type stars. These stars are embedded in a model representation of the inner Milky Way provided by NCSA/AVL to provide context for the visualization. According to Antonini and Merritt’s model, S-stars began much further away from the galactic center. Normal? Yep. Normal mode. Then these seemingly normal orbiting stars encountered the black hole’s gravity and began their spiral inward. As they made the inexorable trek, they then encountered the gravity of other stars in the vicinity which then changed the S-stars orbital pattern. It’s a simple insight, and one that verifies how the galactic center evolves from the conjoined influence of a supermassive black holes relativistic effects and the handiwork of gravitational interactions. Although the presence of supermassive black holes at the center of nearly all massive galaxies isn’t a new concept, further research into how they take shape and evolve leads to a better understanding of what we see around them. These regions are deeply connected to the very formation of the galaxy where they exist. With the center of our own galaxy – Sagittarius A – so near to home, it has become the perfect laboratory to observe manifestations such as S-stars. Tracking their orbits over an extended period of time has validated the presence of a supermassive black hole and enlightened our thinking of our own galaxy’s many peculiarities. Obtaining an accurate distance between the Sun and the center of our Galaxy remains one of the principal challenges facing astronomers. The ongoing lively debate concerning this distance hinges partly on the nature of dust found along that sight-line. Specifically, are dust particles lying toward the Galactic center different from their counterparts near the Sun? A new study led by David Nataf asserts that, yes, dust located towards the Galactic center is anomalous. They also look at accurately defining both the distance to the Galactic center and the reputed bar structure that encompasses it. The team argues that characterizing the nature of small dust particles is key to establishing the correct distance to the Galactic center, and such an analysis may mitigate the scatter among published estimates for that distance (shown in the figure below). Nataf et al. 2013 conclude that dust along the sight-line to the Galactic center is anomalous, thus causing a non-standard ‘extinction law‘. The extinction law describes how dust causes objects to appear fainter as a function of the emitted wavelength of light, and hence relays important information pertaining to the dust properties. Various estimates for the distance to the Galactic center tabulated by Malkin 2013. The x-axis describes the year, while the y-axis features the distance to the Galactic center in kiloparsecs (image credit: Fig 1 from Malkin 2013/arXiv/ARep). Nataf et al. 2013 likewise notes that, “The variations in both the extinction and the extinction law made it difficult to reliably trace the spatial structure of the [Galactic] bulge.” Thus variations in the extinction law (tied directly to the dust properties) also affect efforts to delineate the Galactic bar, in addition to certain determinations of the distance to the Galactic center. Variations in the extinction law imply inhomogeneities among the dust particles. 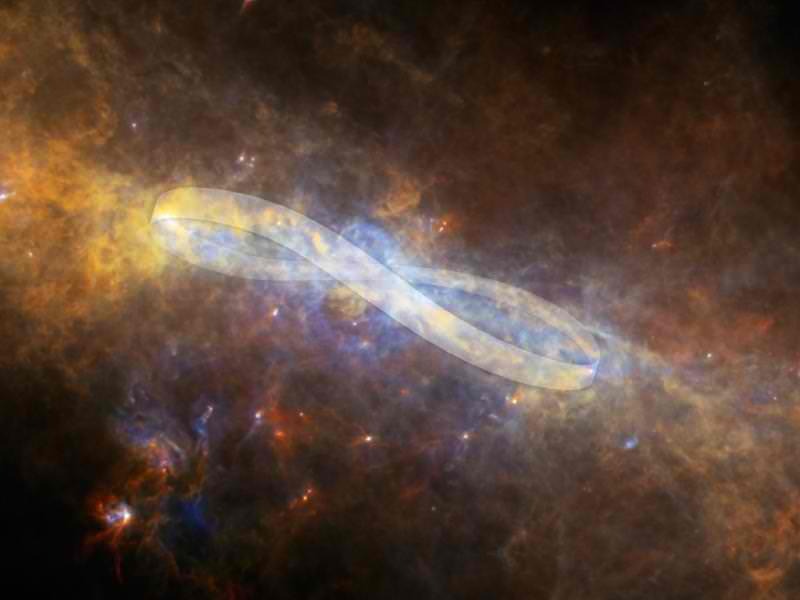 Left, the delineation of the bar at the center of the Milky Way by Nataf et al. 2013. The centerline represents the direction towards Sagittarius (image credit: Fig 17 from Nataf et al. 2013/arXiv/ApJ). Right, a macro view of the Galaxy highlighting the general orientation and location of the Galactic bar (image credit: NASA/Wikipedia). The Galactic bar is not readily discernible in the distribution of RR Lyrae variables. Deviations from the standard extinction law, and the importance of characterizing that offset, is also exemplified by studies of the Carina spiral arm. Optical surveys reveal that a prominent spiral arm runs through Carina (although that topic is likewise debated), and recent studies argue that the extinction law for Carina is higher than the standard value (Carraro et al. 2013, Vargas Alvarez et al. 2013). Conversely, Nataf et al. 2013 advocate that dust towards the Galactic center is lower by comparison to the standard (average) extinction law value. The impact of adopting an anomalously high extinction law for objects located in Carina is conveyed by the case of the famed star cluster Westerlund 2, which is reputed to host some of the Galaxy’s most massive stars. Adopting an anomalous extinction law for Westerlund 2 (Carraro et al. 2013, Vargas Alvarez et al. 2013) forces certain prior distance estimates to decrease by some 50% (however see Dame 2007). That merely emphasizes the sheer importance of characterizing local dust properties when establishing the cosmic distance scale. In sum, characterizing the properties of small dust particles is important when ascertaining such fundamental quantities like the distance to the Galactic center, delineating the Galactic bar, and employing distance indicators like Type Ia SNe. The Nataf et al. 2013 findings have been accepted for publication in the Astrophysical Journal (ApJ), and a preprint is available on arXiv. The coauthors on the study are Andrew Gould, Pascal Fouque, Oscar A. Gonzalez, Jennifer A. Johnson, Jan Skowron, Andrzej Udalski, Michal K. Szymanski, Marcin Kubiak, Grzegorz Pietrzynski, Igor Soszynski, Krzysztof Ulaczyk, Lukasz Wyrzykowski, Radoslaw Poleski. The Nataf et al. 2013 results are based partly on data acquired via the Optical Graviational Lensing Experiment (OGLE). The interested reader desiring additional information will find the following pertinent: Udalski 2003, Pottasch and Bernard-Salas 2013, Kunder et al. 2008, Vargas Alvarez et al. 2013, Carraro et al. 2013, Malkin 2013, Churchwell et al. 2009, Dame 2007, Ghez et al. 2008, Vanhollebekke et al. 2009. The Nataf et al. 2013 results are based partly on observations acquired by the OGLE survey (image credit: OGLE team). Why can we only see so few of these stars? 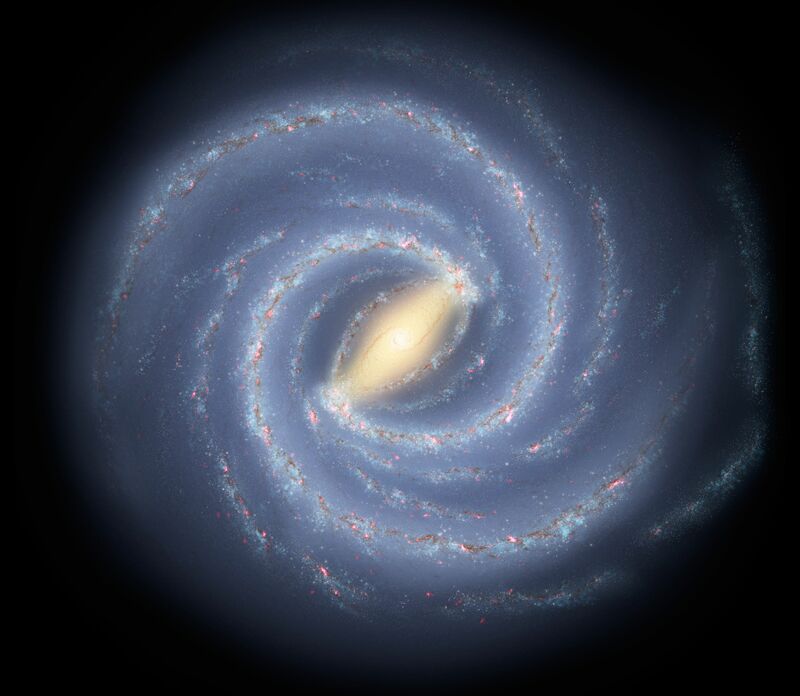 Well, for starters, our Solar System is located within the disk of the Milky Way, which is a barred spiral galaxy approximately 100,000 light years across. In addition, we are about 30,000 light years from the galactic center, which means there is a lot of distance – and a LOT of stars – between us and the other side of the galaxy. To complicate matter further, when astronomers look out at all of these stars, even closer ones that are relatively bright can be washed out by the light of brighter stars behind them. And then there are the faint stars that are at a significant distance from us, but which elude conventional detection because their light source is drowned out by brighter stars or star clusters in their vicinity. The furthest stars that you can see with your naked eye (with a couple of exceptions) are about 1000 light years away. There are quite a few bright stars in the Milky Way, but clouds of dust and gas – especially those that lie at the galactic center – block visible light. This cloud, which appears as a dim glowing band arching across the night sky – is where our galaxy gets the “milky” in its name from. It is also the reason why we can only really see the stars in our vicinity, and why those on the other side of the galaxy are hidden from us. To put it all in perspective, imagine you are standing in a very large, very crowded room, and are stuck in the far corner. If someone were to ask you, “how many people are there in here?”, you would have a hard time giving them an accurate figure. Now imagine that someone brings in a smoke machine and begins filling the center of the room with a thick haze. Not only does it become difficult to see clearly more than a few meters in front of you, but objects on the other side of the room are entirely obscured. Basically, your inability to rise above the crowd and count heads means that you are stuck either making guesses, or estimating based on those that you can see. Infrared (heat-sensitive) cameras like the Cosmic Background Explorer (aka. COBE) can see through the gas and dust because infrared light travels through it. And there’s also the Spitzer Space Telescope, an infrared space observatory launched by NASA in 2003; the Wide-field Infrared Survey Explorer (WISE), deployed in 2009; and the Herschel Space Observatory, a European Space Agency mission with important NASA participation. All of these telescopes have been deployed over the past few years for the purpose of examining the universe in the infrared wavelength, so that astronomers will be able to detect stars that might have otherwise gone unnoticed. To give you a sense of what this might look like, check out the infrared image below, which was taken by COBE on Jan. 30th, 2000. However, given that we still can’t seem them all, astronomers are forced to calculate the likely number of stars in the Milky Way based on a number of observable phenomena. They begin by observing the orbit of stars in the Milky Way’s disk to obtain the orbital velocity and rotational period of the Milky Way itself. From what they have observed, astronomers have estimated that the galaxy’s rotational period (i.e. how long it takes to complete a single rotation) is apparently 225-250 million years at the position of the Sun. This means that the Milky Way as a whole is moving at a velocity of approximately 600 km per second, with respect to extragalactic frames of reference. Then, after determining the mass (and subtracting out the halo of dark matter that makes up over 90% of the mass of the Milky Way), astronomers use surveys of the masses and types of stars in the galaxy to come up with an average mass. From all of this, they have obtained the estimate of 200-400 billion stars, though (as stated already) some believe there’s more. Someday, our imaging techniques may become sophisticated enough that are able to spot every single star through the dust and particles that permeate our galaxy. Or perhaps will be able to send out space probes that will be able to take pictures of the Milky Way from Galactic north – i.e. the spot directly above the center of the Milky Way. Until that time, estimates and a great deal of math are our only recourse for knowing exactly how crowded our local neighborhood is! We have written many great articles on the Milky Way here at Universe Today. For example, here are 10 Facts About the Milky Way, as well as articles that answer other important questions. These include How Big Is The Milky Way?, What is the Milky Way?, and Why Is Our Galaxy Called the Milky Way? And if you’re up for counting a few of the stars, check out this mosaic from NASA’s Astronomy Picture of the Day. For a more in-depth explanation on the subject, go to How the Milky Way Galaxy Works.